/ Volvo v70xc AWD 1998 no heat, blower won't come on. Please help if you can. Volvo v70xc AWD 1998 no heat, blower won't come on. Please help if you can. First thing is to check for voltage at the electrical connector. It sound to me like the blower motor needs to be replaced. Intermittent operation is a sign of worn motor brushes. Sometimes the brushes hang up in the brush holders. You can give the motor a tap and the motor might work for a while. Thank you. I am assuming that you're refering to the elec. conn. for the blower motor. Is is right? I don't know where to find it, perhaps through the glove compartment or maye I'll have to remove the dash? I'll have to research this. I was also wondering if there was some type of thermal fuse for the blower motor and just where this might be located? Thanks again. Hi Tenspeed, It looks as though the blower is behind the glove box. Would it be a good idea to replace the blower motor resistor and fan control relay at the same time? I would not replace the resister or relay if you are getting voltage at the blower motor connector unless there was a loss of blower speeds when the motor did work. Blower motors usually have regular fuses - not the thermal type. Thermal fuses are for important loads like the headlights. Update: I picked up a good condition blower motor from the junk yard. Then removed the glove box and located the blower motor. Tapped the original, non functioning blower motor twice with the handle of a screwdriver and...viola!!!! The heater is now running like a champ, no noise, just fine. Maybe it hit a dead spot for one of the brushes or something. Whatever the case, I am very happy and warm once again! All that effort and worry dissolved away. Go figure, one sure way to fix a problem, buy a new part and problem fixes itself. If I had not bought the used blower motor at junk yard first, I'm sure I would have found that I needed one. Thank you for your help Tenspeed. I'm glad it worked but it probably won't work for long. Plan on installing that replacement motor for long lasting heat. Thanks for the reputation points. Sound advise to hang on to the blow motor. I've already tucked it away knowing someday it will likely have to go into service. This not to mention that the part can't be returned anyway :( , only exchanged for 6 mos. if defective. Thanks again Tenspeed. I have had exactly the same symptoms with my blower motor, on the same year/type of vehicle. Mine died in Saskatoon enroute to Ponoka, AB. Fortunately not too cold out, and the air pressure developed while moving still kept the windshield and two front windows clear of condensation. Repairs to start today. Nice way to end a vacation. Tenspeed: You were correct. It lasted only one day. Determined to fix this, I found a youtube video that showed me exactly how to remove to old one and install the new one! Once you remove the glove box, you realize that the SRS is also in the way. The video helped me to deal with this obstacle easily. It only took 30 minutes and it was done. It is so satisfying to have this working again. Thanks again for your help. Newswede: Good luck with your situation and Happy New Year. Appreciate your regards. Did the job yesterday afternoon with my friend holding the trouble light, and drinking his beer. There was an excellent tutorial on Matthews Volvo site, I believe it was called, complete with pictures. I looked it over ahead of time and completed the entire job in approximately 1hr and 20mins. It was not even close to as difficult as some other heater core/blower installations I have done in the past. hey you want to know more about brush holder in motors. Had a #4 misfire. Changed all spark plugs and #4 coil. Ran great for 5 minutes. Suddenly died and won't restart. Immobolized message on dash. What happened? I live in Killeen Texas if that helps any. 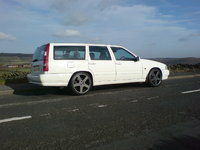 Start a new Volvo V70 question. Looking for a Used V70 in your area? CarGurus has 226 nationwide V70 listings starting at $1,499.